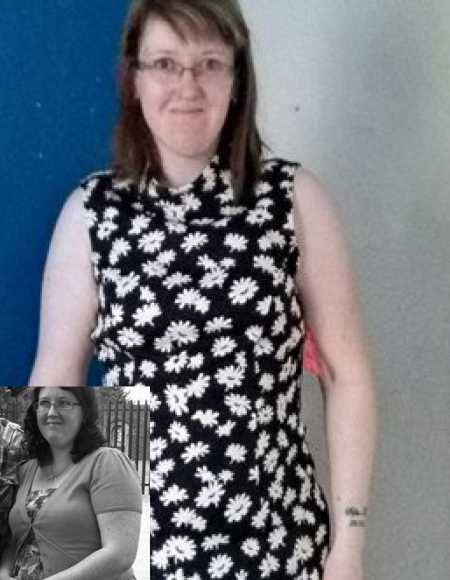 Nicola joined Nutracheck in April 2013 and has lost an amazing 4st 6lbs62lbs28.1kg. I initially went from 15st 7lbs217lbs98.4kg to 10st 11lbs151lbs68.49kg with Nutracheck - it took me a year and 3 months. I regained a stone but used Nutracheck again to get my weight back down to 11st 1lbs155lbs70.3kg, a total loss of 4st 6lbs. I think the reason I regained a little initially is because I pushed myself to lose weight too fast - and I also went a little bit too low for me which made it difficult to maintain. Where I am now feels right for me. I was at my Nan's birthday party, stuffing my face as usual, wearing a dress I thought looked really good on me. My aunt took my photo and a few days later she posted it to Facebook, I was horrified. My youngest child was 8 months old and I knew I hadn't been eating well, but I had no idea that I looked that big. I was under a false belief - I had forced myself to believe that my dress covered my curves... it didn't! My mother and sister were planning on dieting and gently approached me about being overweight, I'm glad they did. They told me they were signing up for a diet website called 'Nutracheck' and my mother offered to pay for the first three months, so I weighed myself in at over 15 stone and decided to take the leap and see what the fuss was about. Before I started Nutracheck my relationship with food was stormy, I didn't understand just how many calories I was consuming each day. I was drinking Dr Pepper at least three times a day and eating large portions of cakes, chip shop and other takeaways at least five times a week. I knew that the food was not healthy but I did not understand quite how unhealthy it was and how much saturated fat I was consuming from day to day. Working in catering I would skip meals, sometimes two meals a day because I was so busy, yet when I got home I would gorge on tuna pasta bake and chocolate which served about four people - all in one go. When I wasn't eating pasta bake, I would be eating fried chicken, chips, ready meals from Herons and doughnuts with cream inside, on my days off I was eating just to fill the time. The most I have gained since I reached my initial target weight is 1 stone, but I have managed to get that back down to my current weight of 11st 1lbs. Since losing weight I've found the courage and confidence to go back to work. I actually found this extremely easy and didn't even miss the extra food in the slightest. I did learn how unhealthy the foods I was eating really were, it was black and white in front of me and it was a real shock. Giving up my fried chicken was the hardest thing, and other fried foods which I had been living on since the birth of my daughter. I can actually chase the kids now when they run off. I can also run for the bus without getting a stitch or chest pains. It's also nice to be able to hug my knees without my stomach getting in the way. Since losing weight I have found the courage and confidence to go back to work, I am now back working with my old employer as a catering assistant and I can handle food without feeling the need to eat it. I now find I have a better relationship with food, this, in turn has had a positive effect on my family. Don't let a little bit of weight gain get to you, this does not reflect you in the slightest, it's simply a hiccup, get back on the horse and carry on - better luck next week. Take it slow ... I found that trying to lose 2lbs a week was brilliant, however when I went to maintain I found it difficult to stay at a low weight, this was because I was rushing myself. Try 1lb or even 0.5lb per week instead, slow and steady is better in the long run and in my opinion stops you from relapsing into old, bad routines. Try and get some support, I had to do this alone. My mother and sister were living together and I lived with my husband, even though they helped me over the phone, it was hard living with a junk food addict - it's important to get your partner on board. I stopped my husband bringing unhealthy foods in to the house or eating them in front of me. I made sure he did not offer me any junk food - this helped a lot. For example, I would ask him if he could eat it in another room and banned him from trying to tempt me into snacking with him. I close my kitchen at 7pm (for food) this has not only helped me but has also limited the sugar intake that my two young children are consuming.